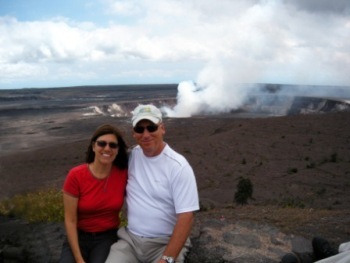 of the Kilauea Volcano on the "Big Island" of Hawaii. 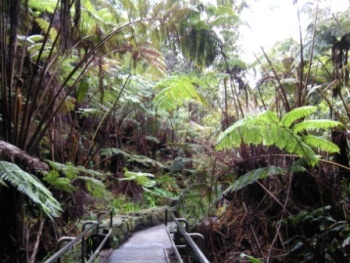 Even though the landscape is almost lunar inside the steaming Caldera, the nearby path to the Thurston Lava Tube is almost Jurassic in vegetation. 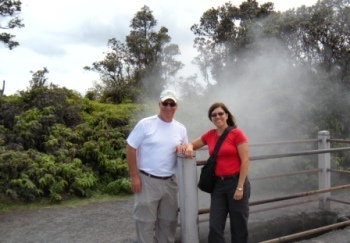 from "vents" in the earth. 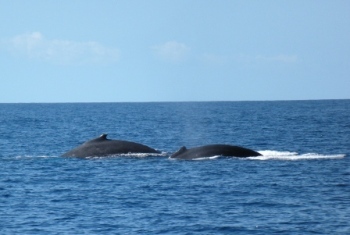 On Maui, we went whale watching in a Zodiac boat. 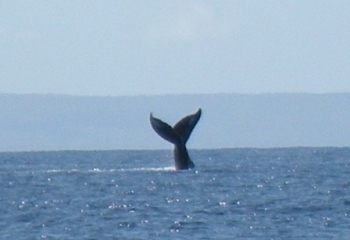 There were over 600 whales in the bay. 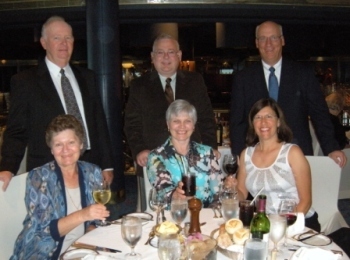 Mothers were preparing their calves for the trip north to Alaska at the end of next month. 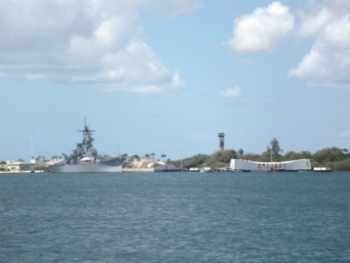 In Honolulu, Oahu, we visited Pearl Harbor and saw the Mighty MO (left) and the Arizona Memorial (right). 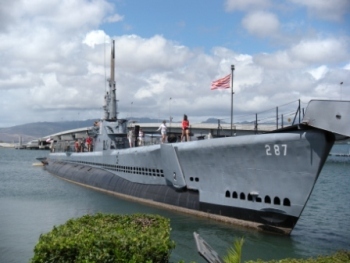 The USS Bowfin submarine sat nearby. 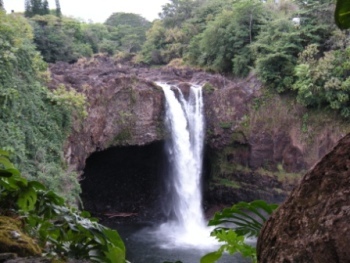 because of over 100" of rain per year. The surf was wild with huge rolling.waves. 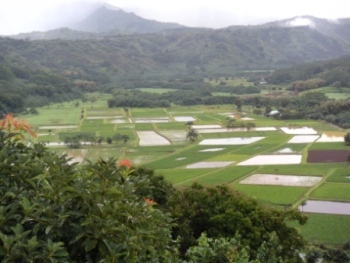 Many people think it is the most beautiful Hawaiian island and taro fields fill the valleys. 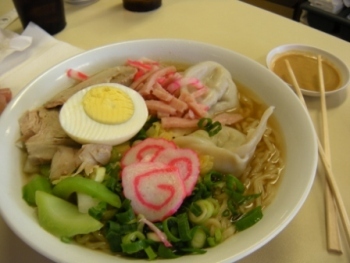 noodles, won ton, hard-boiled egg, fish cakes, chopped ham and vegetables - in a tasty broth. 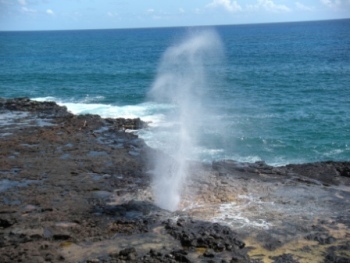 Near Poipu, a blow hole called the "Spouting Horn" shot sprays of water high into the air with a roar. 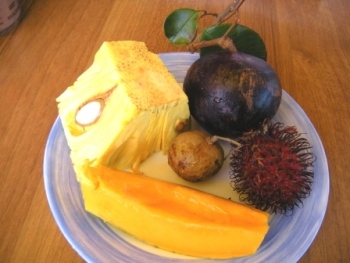 On board the ship, we were served a buffet of exotic fruits for lunch. 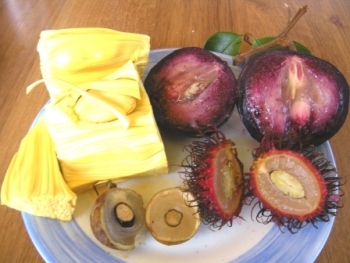 Clockwise from the front - papaya, Jackfruit (had the texture of paper and the flavor of JuicyFruit gum), Longan (texture and taste of a firm grape), Custard apple (texture of Jello, taste like plum) and Hairy Rambutan (texture of a grape, taste of peach/pear). 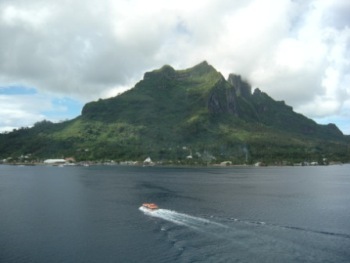 Fanning Island is an atol that once was a volcano. 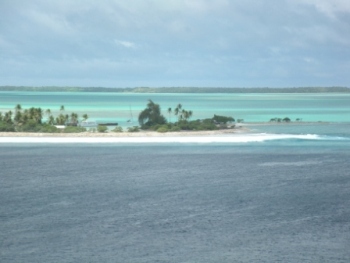 The eroded center is now a beautiful lagoon. 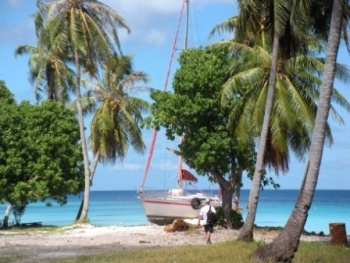 It has no electricity, cars nor running water; but the white sand and almost 2,000 friendly residents make it a lovely place. 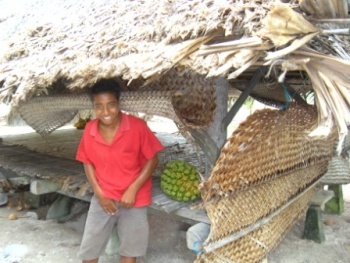 The island families speak some English, but the native language is I-Kiribati. 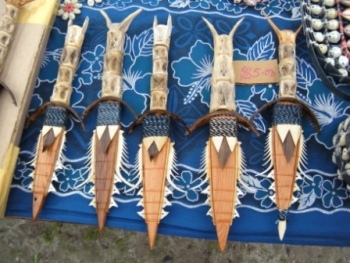 They don't have a currency, but sell shell jewelry, carvings and knives like these made of cocount wood and sharks' teeth for US Dollars. Everyone we met, including the children, was very friendly and wanted to show us their homes (like this boy) who showed us the family sleeping area. 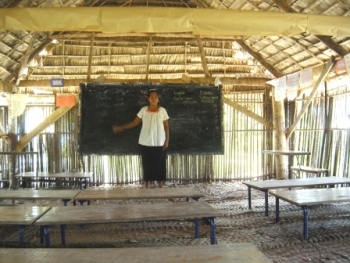 The 30 year old first grade teacher (and mother of 6 children) invited us into her classroom. 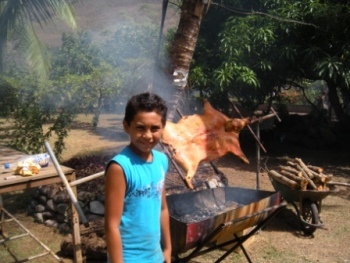 boarding school on Christmas Island. and it's every exotic thing you've every dreamed of. 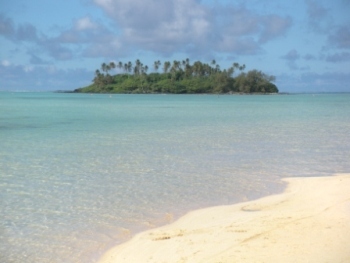 Look at this Bali Ha'i of an island just off of Muri beach, with cystal clear blue water and white sand covering the entire floor of the lagoon. 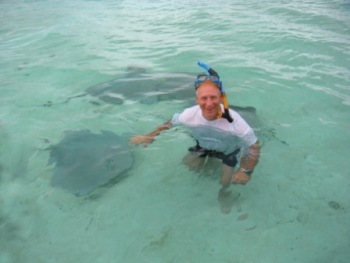 We walked to it in beautiful, warm water no more than 3 1/2 feet deep! 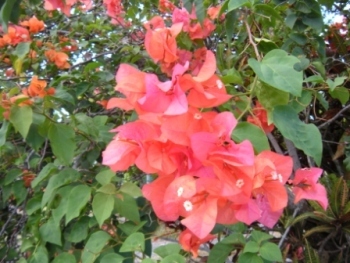 trees and shrubs all over this island. To quote Arnold Schwartzeneger, "We'll be back!" 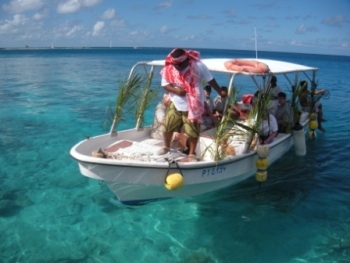 (a small island formed on the coral atoll which surrounds the main island, which is an extinct volcano). 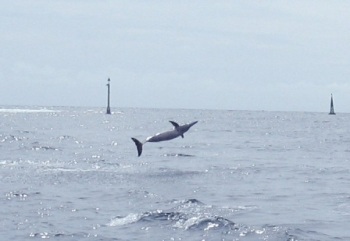 What we didn't expect to see were several Spinner Dolphins that greeted us when we entered the pass. 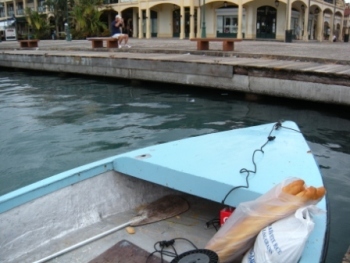 included a bag of baguettes. 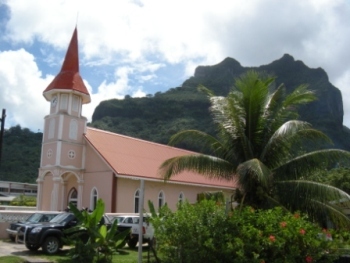 Palm Sunday amid the palm trees at Bora Bora? 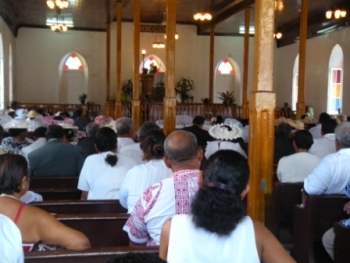 The Evangelical church was packed with people wearing island prints and lovely hats made of palm and flowers. 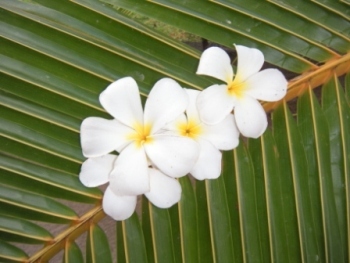 Unfortunately, we didn't understand a word of the Tahitian French; but the traditional singing was great. 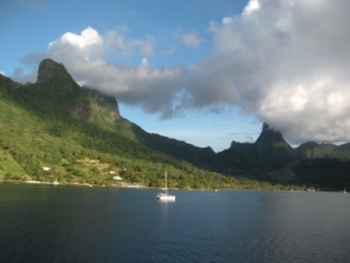 A guy named Mata took us out for a 3 1/2 tour of the Bora Bora lagoon. 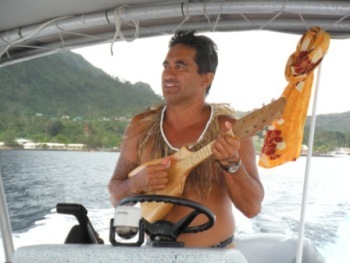 While he drove the boat, he played his ukulele and sang to us in his language. 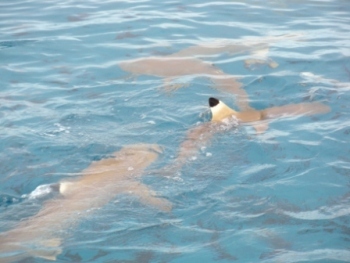 Outside of the lagoon we had the opportunity to swim with non-threatening 4 foot long Black Tipped sharks in the deep water; but when we looked at the ocean floor we saw 8 foot long Lemon Sharks! 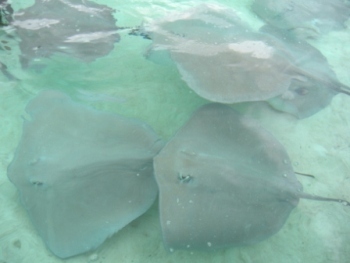 After returning to the shallow water of the lagoon, we were able to spot a huge school of stingrays and swam with them. 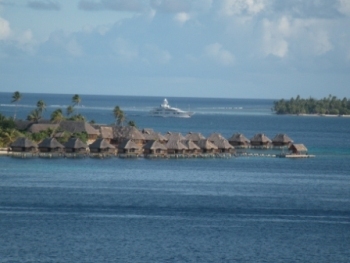 (that cost around $800 per night) sat mostly empty because of the depressed world economy. 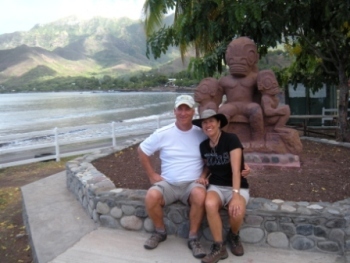 Vicki is starting to look like the fertility goddess. 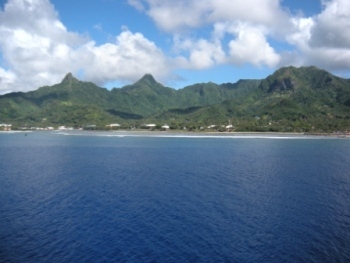 The lush skyline in Cook Bay, Mo'orea was dramatic. 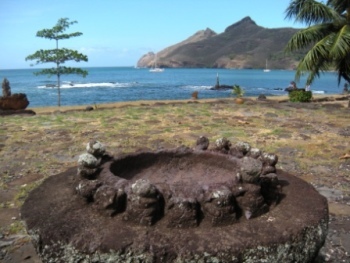 The island is only half of what is left of an extinct volcano. 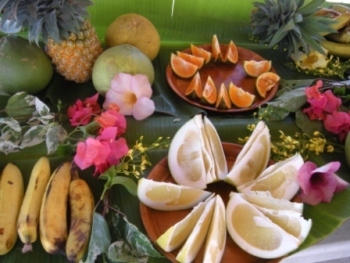 On shore, the villagers had a buffet of tropical fruits waiting for us. hitchhike to get there quicker. We got lucky; and after a couple cars passed, a French couple from Cassis picked us up. Turns out they were going to the same beach. We made friends and they drove us back to the ship after a lovely morning. even at the tender dock. 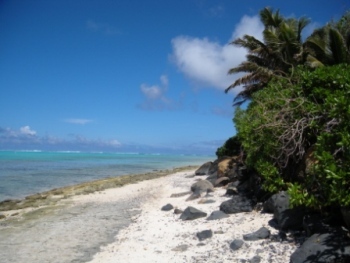 We walked down the only road on the atoll (made of packed coral) and went to the lagoon side to snorkel. 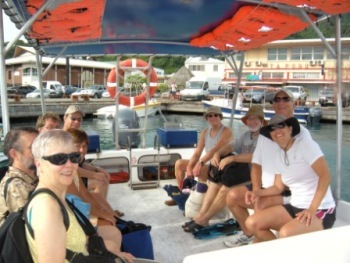 We saw stingrays and lots of fish, but the coral lacked color. 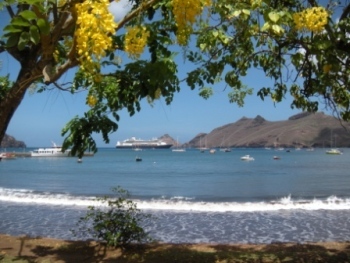 Nuku Hiva, Marquesas was a return to arid islands like the Canaries. 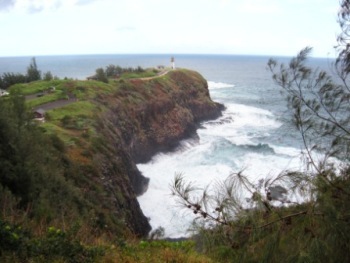 The rugged mountains surrounding the bay were so servere, even a costal road was impossible. 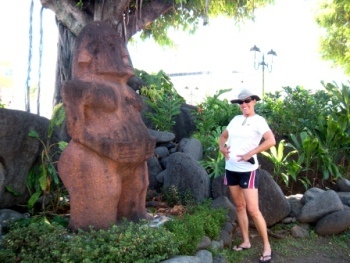 The tiki statues showed the influence of Easter Island. where some grizzly things may have taken place before 1845 when the French killed the war chief. 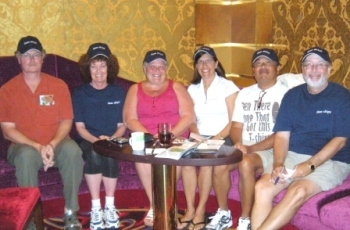 Mark, Yvette, Lisa, Vicki, Ron & Rick.